According to Ilana Garon, popular books and movies are inundated with the myth of the “hero teacher”—the one who charges headfirst into dysfunctional inner city schools like a firefighter into an inferno, bringing the student victims to safety through a combination of charisma and innate righteousness. 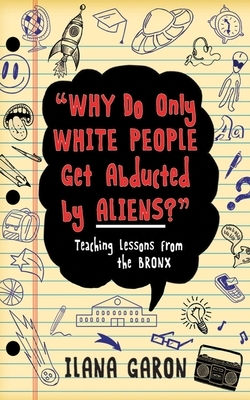 The students are then “saved” by the teacher’s idealism, empathy, and willingness to put faith in kids who have been given up on by society as a whole.“Why Do Only White People Get Abducted by Aliens?” is not that type of book. In this book, Garon reveals the sometimes humorous, oftentimes frustrating, and occasionally horrifying truths that accompany the experience of teaching at a public high school in the Bronx today. The overcrowded classrooms, lack of textbooks, and abundance of mice, cockroaches, and drugs weren’t the only challenges Garon faced during her first four years as a teacher. Every day, she’d interact with students such as Kayron, Carlos, Felicia, Jonah, Elizabeth, and Tonya—students dealing with real-life addictions, miscarriages, stints in “juvie,” abusive relationships, turf wars, and gang violence. These students also brought with them big dreams and uncommon insight—and challenged everything Garon thought she knew about education. Ilana Garon is an English teacher at a public high school in the Bronx, New York, and holds master’s degrees in both secondary English education and fine arts. Throughout the past ten years, she has taught every level of high school English, from ESL to AP, and even math in emergency situations. She also writes about education issues for Dissent Magazine, Huffington Post, and Education Week. Ilana lives in New York City.